31 October marks the 40th anniversary the Moroccan invasion of Western Sahara. Known as Africa’s last colony, Western Sahara is the only Territory in Africa to never complete the process of decolonisation. Despite a ruling by the International Court of Justice making clear that Morocco had no claims to the Territory, on 31 October 1975 Morocco invaded Western Sahara driving people out with bombs and napalm into the Algerian desert. 40 years later 165,000 refugees from the conflict still remain in desert refugee camps, dependent on international aid. In the last week the refugee camps have been affected by severe flooding, with 25,000 people displaced. Those who did not flee in 1975 now live under a brutal occupation where they face false imprisonment, torture and sexual violence simply for objecting to the occupation. Despite well - documented human rights violations against the Saharawi, the UN peacekeeping mission in Western Sahara is the only modern peacekeeping mission without a human rights mandate. Frustrations amongst the Saharawi are running high at the failure of the UN to either protect the human rights of the Saharawi people or organise the referendum on self-determination they promised in 1991 to deliver. 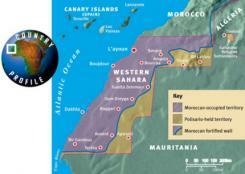 The natural resources of Western Sahara are exploited through agreements with Morocco. In December 2014 UK firm Cairn Energy, in conjunction with US Kosmos Energy began drilling for oil off the coast of Western Sahara. San Leon are also drilling for oil. The controversial Fisheries Partnership Agreement between the EU and Morocco allows EU boats to fish off the waters of Western Sahara, despite fierce objections from the Saharawi people. In response to the exploitation of the Saharawi’s resources the Western Sahara Campaign is currently pursuing legal action against DEFRA and HMRC in a case that has just been referred to the Court of Justice of the European Union. “The UK must stop colluding in the illegal occupation of Western Sahara. For too long governments have ignored their obligations under international law and made agreements with Morocco to exploit resources that do not belong to Morocco while the rightful owners suffer”. "The UN is aware of the general feeling of impatience, particularly amongst young people. This is why they always mention our right to self-determination in their reports and resolutions. We don't stop telling them that they have to speed up this process in order to avoid a return to violence. We hope that the UN makes progress, otherwise the Saharawis, especially young people, have to prepare to take up arms again. We are tired of this situation."